I love my Kindle. It’s one of the originals so it’s pretty old by modern tech standards (it still uses buttons instead of touch screen!) but it does everything I need it to do. And in fact I would go so far as to say that the user experience is much better than a tablet as you can operate it with one hand. Perfect for commuting or you know, drinking tea. 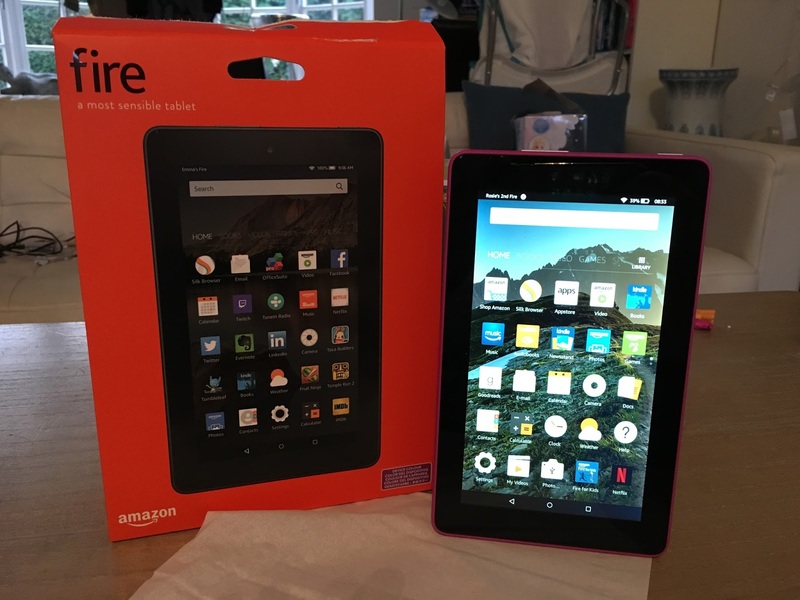 But I also love a good tablet and when I got the chance to try a Kindle Fire I couldn’t turn it down. I think the Kindle Fire’s best feature is its simplicity. Or maybe it’s price – at only £49.99 for 8GB this is a great value piece of kit. But really, it’s just super easy to use. Setting up is a cinch. It takes you through each step with clear instructions – language, WIFI connection, Amazon account linking etc. Then on the home screen you just scroll down to see all your apps. No swiping 5 times to get to the right page or complicated menus. The Amazon apps are shown separately, but you can also access each service – video, books, games and shopping by swiping left. All the data from my Amazon Prime account was visible and I can choose which items I want to download. Of course this tablet is ideal for Prime users but is still pretty handy with a regular account too. Of course as a mum, parental controls are important. At the moment I can limit usage by simply taking the tablet away without too much trouble and the kids are only interested in watching Netflix on it anyway. But as they get older it will become essential. Luckily setting up limits for usage, filters for the internet and content and usage monitoring is again, super simple. You can set up unique profiles for each child and even one for the man child in your life if you have one. I like the app store, it has quite a lot of content, although probably some of the more business related apps won’t be in there as these tend to get developed for iOS and Android. However the Fire OS was originally an Android system so I’m sure where there’s a will there’s a way. There are lots of free apps and games though, which is great and less need for in-app/game purchasing. Overall this tablet is great. But what of the most important aspect – the reading experience? Well I had just started reading the 5th Outlander book – The Fiery Cross – on my other Kindle. I was pleasantly surprised to find that after downloading it into my book store, it opened to the page I had left off from. I still maintain that touch screen is rubbish for reading one-handed. Unless perhaps you have big hands. And due to the nature of the screen reading in sunlight obviously isn’t as good. But overall it’s a pretty decent reading experience. My mum is an avid reader and I bought her one of these for her recent birthday. I was worried she wouldn’t use it much as at 60+ she doesn’t get on that well with new technologies. However she was really pleased with it and is always phoning me excited about the new book she has downloaded or TV show she has watched. So if you’re looking for a Christmas gift this is a sound buy – even for people who already own a tablet.